Well here is a really excellent deal that you might want to jump on. 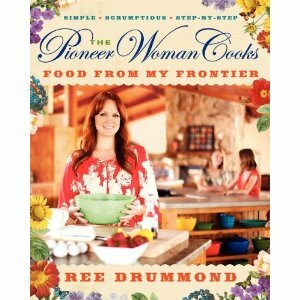 You can get the brand new (ok released in March but that is still new to me) cookbook from the Pioneer Woman. This is the Kindle version of the book so you can read it on an iPhone, iPad, Kindle or computer. You might be able to grab this for a Nook too. I have her first cookbook and I occasionally catch her show on Food Network. Ree does really yummy recipes that are not terribly complicated and she specializes in comfort food. My favorite recipes from her older book included the Texas sheet cake and this incredible gooey olive cheese bread. I just grabbed this one to read on my iPad. Hurry over to get The Pioneer Woman Cooks for just $3.99. That price can change at any moment! You can grab the hardcover of her original cookbook for $17.25. Oh Jane- that sheet cake is really really good. I am sure your mom’s is better but I can tell you that sheet cake does not last long in our house. Mostly because of me :D.